This manuscript was written by a Continental scribe, probably in France. A flyleaf inscription, probably written in the 16th century but imitating 11th-century English script, is perhaps a copy of a now-lost inscription, that states that the book was given by King Athelstan (reigned 927-939) to St Augustine's abbey, Canterbury. If the inscription is to be believed, this manuscript represents an example of foreign book-decoration that native artists could have seen and assimilated into their own work. 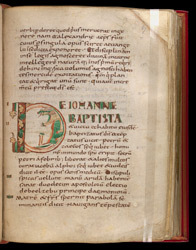 This initial 'D' introduces the second prologue to Mark, with a stylised animal within the curve of the letter.